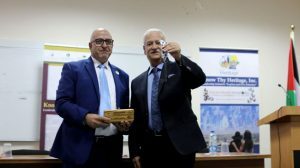 Birzeit University hosted the 7th Annual Palestinian Diaspora Conference, organized by the Holy Land Christian Ecumenical Foundation under the Know Thy Heritage Program, on Saturday, July 14, 2018. The conference, attended by a group of officials and Palestinian diaspora community representatives, reconnected Palestinian diaspora leaders to their roots, in addition to establishing links with youth, development, and economic institutions in Palestine. “Since the 1948 Nakba, Palestinians have been uprooted from their homes. A big part of them emigrated abroad, but their hearts and souls are still connected to Palestine,” said President of Birzeit University Dr. Abdullatif Abuhijleh in his welcoming remarks, who expressed his pride in the choice of the university as this year’s conference host. Abuhijleh went on to highlight Birzeit University’s role in the development of Palestine and shed light on continuous Israeli disruption of the Palestinian right to education, particularly the violations of Birzeit University’s campus. He also drew attention to Birzeit University’s Palestine and Arabic Studies Program, one of the most impactful internationally-targeted programs in the region. The program, launched in 1994, enriches the university’s atmosphere with multicultural, multi-perspective interaction and discussion. Rateb Rabie, president and CEO of the Holy Land Christian Ecumenical Foundation, noted that Know Thy Heritage was active in more than 15 countries around the world, and said that the annual diaspora conference “aims to focus attention on the most significant Palestinian issues,” in addition to uniting Palestinians in the country and abroad in search for solutions. The foundation, he added, has launched a program specifically-designed for diaspora Palestinians who want to experience Palestine anew after many years of living abroad.